Anyone can Shop & Save with Just Between Friends at the Grapevine Convention Center! 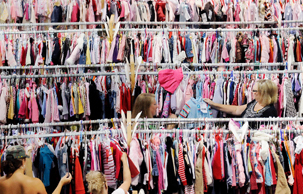 Come shop our Huge Kids' Sale 50-90% OFF Retail plus over two dozen vendors! Shop for yourself, your kids and everyone else on your holiday shopping list! Shop thousands of items all under one roof! We gladly accept cash, Master Card and Visa. Parking is FREE! COUPON HERE - Kids are Free if supervised by adult at all times! Sign up to receive our emails & join us on Facebook for the most up-to-date news on everything JBF-Grapevine! Love this location & the people are great too! I like finding great deals on used kids items.